I thought it might have just been a fluke when Emily posted about Elle Decor running out of magazines. "We apologize that this issue is permanently out of stock"
Are you friggin kidding me?!?!? I am a subscriber, don't I get some sort of preference over the newsstands? I know that newsstand sales (book stores, grocery stores, etc.) don't even count as 20% of the total subscriber numbers. I also know that subscriber numbers are important to advertisers in deciding how much they spend with Elle Decor. So if Elle Decor still wants lots of advertising dollars pouring in then they should take care of their monthly subscribers NOT the single newsstand sales! Ok, rant over- but I am annoyed and will not forget this anytime soon Elle Decor! *UPDATE- Elle Decor customer service, AKA Margaret Russell, is all over this. I was shocked (amazed, excited, every word you can think of for ecstatic) to see that Margaret herself left a very nice comment on this post that the magazine shortage was just a little mix up and nothing else. Take note bloggers- all will be ok in the magazine world and Margaret Russell is my new BFF. I haven't gotten mine either!!! I thought it was just because I'm in podunk M'ssippi and I always seem to get my magazines a week late, but I am so not happy with this!!! Wow, that is unbelievable. I did receive mine in the mail two days ago....who knew I was one of the "lucky" ones. I am running to my local kiosk for my own copy, if they have one, would you like me to send? That is craziness. Talk about a bad PR move. Patricia, you are so sweet- thank you for the offer! I just saw one at my local Borders and picked it up. Thank you though, that was so nice of you!!! That is totally strange! Never heard of such. I just got mine here in Nashville a few days ago. I'm surprised the bigger cities didn't get theirs first. I'd be mad too! I get my subscription online through zinio, better for capturing screen grabs for blogging anyway, you should try it out! wow! i've never heard of something like that - you would think they would print AT LEAST enough magazines to send to their subscribers (that # isn't exactly a surprise or anything). 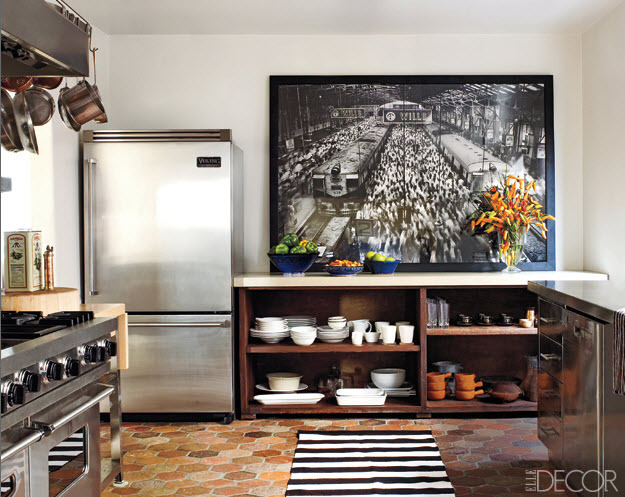 And that photo of the kitchen is making me drool. CAn you believe this? The June issue better be freaking awesome. I am so annoyed and the one i just bought is so not as cheap...the reason why I SUBSCRIBE! there, my rant is over now. Are you free one night next week for drinks? talk about a major FAIL! i wonder what they will do to fix it. Wait....what? You are not getting one from them? Ever? How is that even possible? I am speechless. Boo Elle Decor, Boo. strange, you are right, subscribers should even get their magazine before it hits the newsstands, no? Wow... how can that happen?? Ya That would tick me off to! That is crazy! I've never even heard of that happening. At least they updated their website so it will be easier to find pictures from this month's issue. I hope they decide to print more for the next issue! Please take a collective deep breath: If you're a subscriber and you didn't receive your magazine, e-mail us at elledecor@hfmus.com and we will send you a May issue. We truly love our readers, and this is simply a snafu, not a vast publishing conspiracy! Just got mine yesterday, phew. I have so much catching up to do over here! This is wild. I'm glad they're sending one over. I miss you! Good cust service to comment on blogs, I'd say! Still havent gotten mine... But I DID buy it from the newstand cause I was so impatient. Yeah! We should have known Elle Decor would not let us down! I love the fact that MR left you a comment. lucky girl. that is almost better than the issue itself. Got mine...Probably because it was my last issue before I had to renew it! and there goes that blue and orange again! I called as well for the same reason..crazy. I just received my copy a couple of days ago, I would have been really annoyed if I purchased the May issue. Good for you, glad to hear that MR left you a note!